Greetings once again, Stampers! It warmed up to 32 degrees here yesterday, which felt like a spring day compared to what it's been like the last week or so. I've been so chilled to the bone that I've been falling asleep with thick socks and a fluffy bathrobe on every night. I'll be so glad when it warms up enough for me to get back on my bike. (Note: the lead-in here, LOL!) 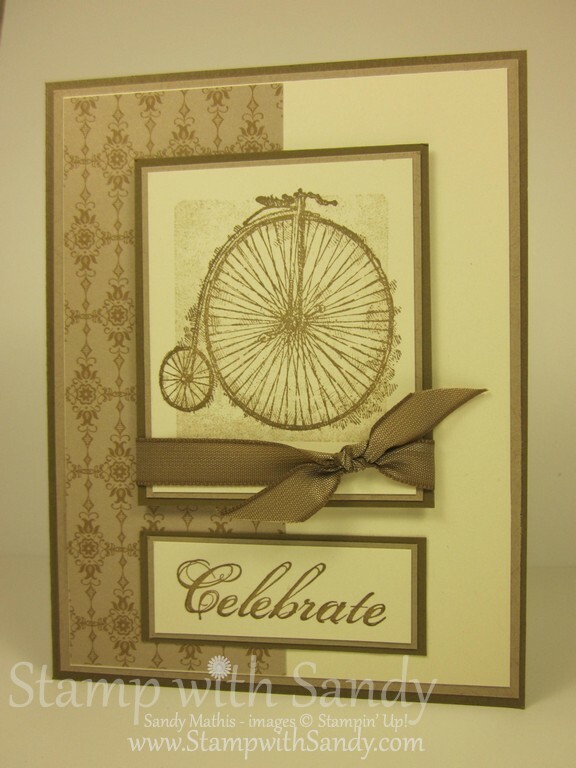 Speaking of bikes, I'm really liking this vintage one in the Feeling Sentimental Stamp Set. This is another set that you can earn free from Stampin' Up with a $50 purchase during Sale-A-Bration, which runs now through March 22. 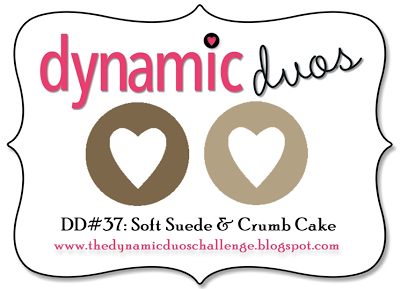 The Dynamic Duos design team has a monochromatic color challenge for us this week, Crumb Cake and Soft Suede. I haven't had a chance to play along with their challenges the last few weeks and I'm very happy to do so today! 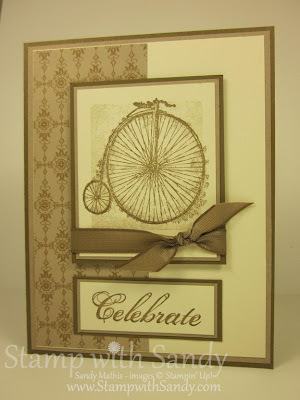 For the focal image, first I stamped the background, which is simply a clear block inked with Crumb Cake Ink. I stamped the bicycle over it in Soft Suede. I originally intended to keep this card a little more masculine and use brads instead of ribbon, but alas, I had a little "oopsie" and had to cover it up with ribbon. It's all good; I like the way it looks anyway! 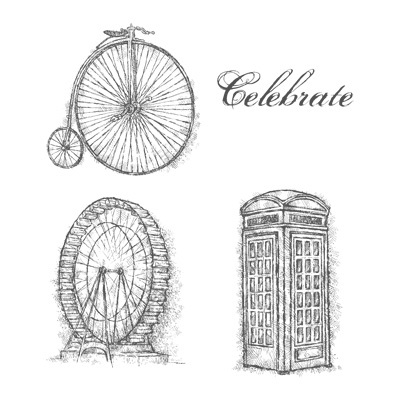 If you would like to request a free copy of the Stampin Up Spring or Sale-A-Brations Catalogs, Click here. If you'd like to shop Stampin' Up now, Click here. This is SUCH an amazing card for that image, Sandy! WOWO!! I'm glad it "warmed" up for you!! Great card, Sandy! The color block behind the bicycle really helps to enhance the image. Isn't funny how our mishaps while making our cards turn into happy creative results? The ribbon really looks wonderful. Love this card! What a perfect image for this week's colors. Your layout and choice of papers are perfect. 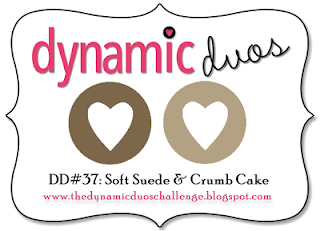 So glad you joined us this week at Dynamic Duos. 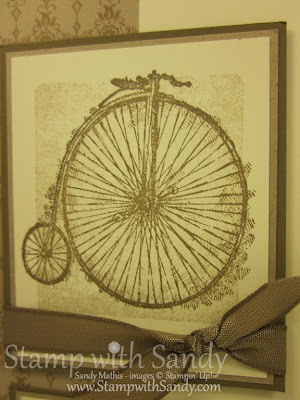 I love the way you have stamped the background using the clear block, it creates a lovely frame. Great idea! Thanks for sharing your card with us this week at Dynamic Duos.